The Central Nervous System consists of the Brain, which is the Headquarters of the Nervous System, and the spinal cord where agents of both the CNS and PNS team up to share information acquired from the H.Q. The Peripheral Nervous System is somewhat like the messenger service of the Nervous system. It is broken down into two major parts the afferent division and the efferent division. 1. The Afferent Division: This division of the PNS holds Humansvilles most elite message carriers. These messengers can take messages all over the body and delivers them to different CNS research labs. 2. The Efferent Division: This division of the PNS carriers motor commands to muscles and glands all over the body. This division is further broken down into two subdivisions the autonomic and somatic branch. 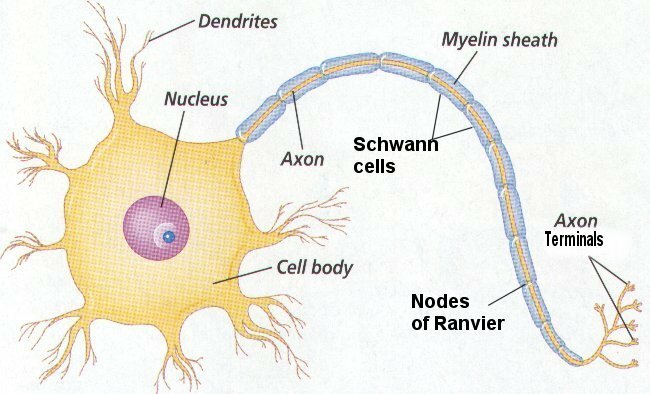 Somatic Nervous System This division makes sure we have control over our skeletal muscles. Autonomic Nervous System This branch of the PNS provides automatic, involuntary control of Smooth muscle and glandular activity and secretions. The ANS also has its own support units. These are the highly specialized lab workers of the Sympathetic and Parasymathetic divisions. Sympathetic Division: Preganglionic fibers from the thoracic and lumbar spinal segments synapse in ganglia near the spinal cord. The Sympathetic division is often called the fight or flight system as the scientists of these labs work almost exclusivly with Metabolism and it can increase the energy in the human body. Parasympathetic Division: Preganlionic fibers from the brain and the sacral spinal segments synapse on neurons of the intramural ganglia located near or in the the tissues of viseral organs. The Parasympathetic is often called the rest and digestive system because scientists of this region focus mainly on metabolism and how it can be used to slow the body down to perform functions such as digestion.